ʻAlalā once lived across Hawaiʻi Island. Now, due to a variety of threats in the wild, these birds are mainly found in captive breeding programs. 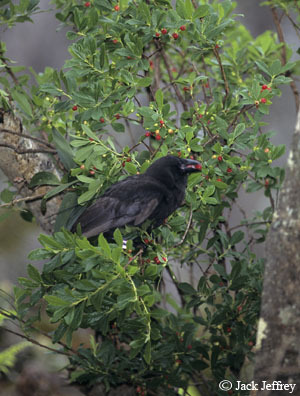 2002 – A single pair of ʻAlalā was last observed in 2002 in South Kona. ʻAlalā played an important role in the forests where it lived. It was an important seed disperser for many native plants. It ate the fruits of these plants, flew to another location, and left behind the seeds that had passed through its digestive tract. Without the ʻAlalā, these native plants can have a harder time spreading and reproducing. Due to a sharp drop in their population, a handful of ‘Alalā were brought into captivity in the 1970s. These birds helped form the beginning of the captive breeding program. As of 2017, there were over 125 birds in two breeding facilities managed by the Hawaii Endangered Bird Conservation Program (San Diego Zoo Global).